Peace-building begins in early Childhood, a period of innocence which knows no discrimination, where no one and nothing is ‘strange’ until someone older says so. After that, efforts at building peace become more difficult, and young adolescents sometimes require adult intervention specifically designed to reduce bias, and explain the negative consequences of discrimination, stereotypes, and exclusion. It is this aspect which makes Randa Hamwi Duwaji’s stories so timely. They not only provide enjoyment and reinforce moral and environmental values, but are ideal in promoting multicultural education for youngsters aged 9-14. Here, Peace-building can also get a head-start, as younger children listen to the voices of loved ones bringing the delightful Arab-Muslim characters to life! Downloadable stories for personal viewing and use. Please contact Author for academic purposes or reproduction. Dedicated to nieces and nephews being raised away from their native culture, this collection of delightful stories provides an entertaining look into Arab/Muslim family-life, as seen through the eyes of its 11 year old children. 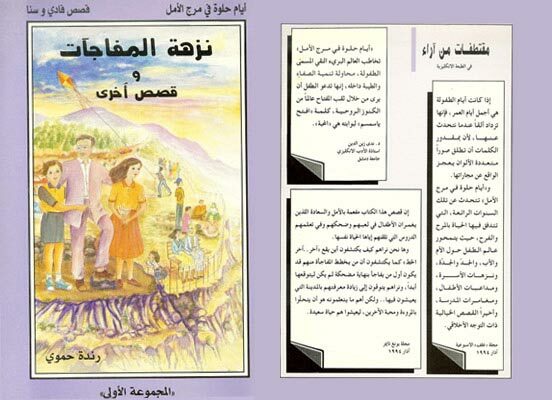 Rewritten for young Arab readers, 'Ayyaam Hulwah fi Marjel-Amal' reintroduces the twins Fadi and Sana, only this time they speak their mother-tongue. This is a bonus for parents and teachers who can use these Arabic stories side-by-side with the English, effortlessly teaching their children a second language. Providing a unique cultural experience for English-speaking readers, this beautiful story aims to raise environmental awareness as it introduces children to wildlife conservation in the United Arab Emirates. Published by ERWDA: Environmental Research & Wildlife Development Agency. Through Hamad's story, Arabic-speaking children are introduced to falconry, environmental awareness, and wildlife conservation in the United Arab Emirates. With Comprehension questions, Composition, points for Discussion, as well as a Glossary of word definitions, this 'Fun Workbook' is the PERFECT companion to Delightful Days in Marjella, enhancing motivation and providing occasion for family/class interaction and rapport. Behind Grandma's house is a lake full of ducks. 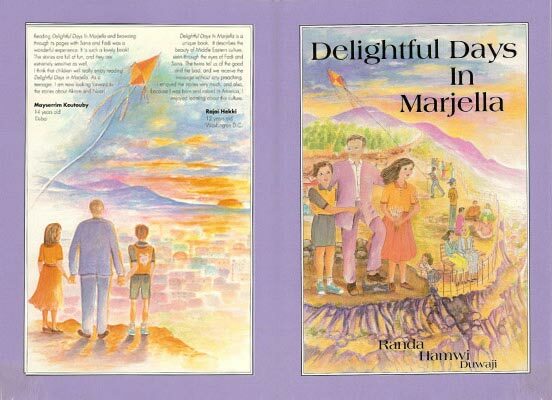 Reading Delightful Days in Marjella and browsing through its pages with Sana and Fadi was a wonderful experience. Heartbeats in the Wind provides readers with the rare privilege of peering into the mind and soul of modern Arab Muslim womanhood. Comfortable in her ‘three cultures', Randa Hamwi Duwaji calls for open dialogue to heal the rift resulting from the tragedy of 9/11. She believes Truth to be the first and most difficult step, and thereupon bares her most personal emotions and thoughts in poetry and lyric. Passionate, yet balanced and analytical, Heartbeats in the Wind speaks a universal language everyone can understand. "Heartbeats in the Wind is a cry to be heard in a world that seems deafened by the explosions of the past year and is unable to hear the voices of moderates. 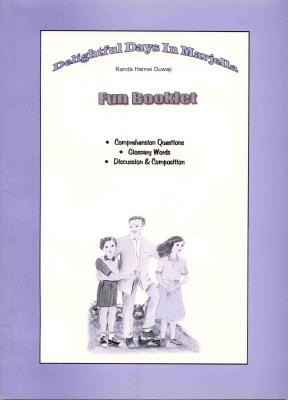 It showcases the lyricism and passion of Randa Hamwi Duwaji, one of the Islamic world's finest poets and writers for children in the English language. The ideas she expresses deserve consideration by anyone who professes an open mind. Heartbeats in the Wind is an antidote to everything that has been said on the subject." Assistant clinical Professor, Georgetown University. "Heartbeats in the Wind conveys the daunting effort so many Americans of different backgrounds relate to as we try to sustain identity, balance beliefs and preserve cultural integrity. As a Palestinian, I was particularly moved by the ‘Arab Heart' section; my people's sufferings were so well expressed! And as a Christian, I felt that the vital question posed in ‘The Challenge of Nine Eleven', rightly puts the onus of introspection of the book's central elements -Love, Tolerance, Peace, Justice -on all of us, ‘America, are we up to it?' Indeed, Heartbeats in the Wind challenges both Arabs and Americans - Are we up to it?" "Randa Hamwi Duwaji has added a wonderful artistic dimension to the quest of Deir Yassin remembered to build a memorial at Deir Yassin to honor those palestinians who were massacred there in 1948. Her poetry has been used in two of our largest theatrical productions in london and her Haiku has been cast in bronze on the first Deir Yassin Memorial in the United States." Founder of ‘Deir Yassin Remembered,' at Hobart and William Smith Colleges. Also of importance is the theme of humanity as a whole, and most of these poems, although perhaps inspired by her own experiences or by tragedies from Palestine, are ones which we can all relate to. She writes of our common existence, of our shared experience. In her Epilogue, she asks this: "Where is this unmarked grave? Does it matter? We should be able to feel the same empathy wherever this human voice comes from, for only with the strength of one united conscience that sees humanity on an unmarked human plane can we work effectively to prevent the tragedies we wreak upon ourselves." "Randa Hamwi Duwaji writes from an Arab heart that has experienced universal suffering and found sustenance in the roots of her motherland- roots that branch out in a spirit of love for humankind everywhere. Upon a global canvas she depicts Man's defamation of Man and the erosion of morals as people stray from core Human values, principles advocated by Monotheistic faiths and confirmed by scholars and sages throughout time. The author delivers an engaging literary expos' as she intersperses poetry with prose in an attempt to discover the meaning of her existence and reveal the true path of Humanity. Her journey is lit with such passion that prose becomes poetry and poetry prose, the intellect whispering in an undertone, surfacing and plunging into depths of the conscious and unconscious. It is an authentic personal experience in every sense- or more precisely, the experience of an entire nation as it searches for itself within the global horizon, a horizon that consists of both good and evil." "It is remarkable to tap the pulse of an expatriate Arab heart as it travels through time, composing music that overflows with notes of humble devotion and divine love. Spending hours with Randa Hamwi Duwaji's words that sparkle with the spirit of her Arab and Muslim heart as they sing to its rhythm, I found her serenade to loved ones especially moving in its purity and sincerity. I pray to God that her endeavor helps shape the future to the best of aspirations for the children of tomorrow."